Getting rid of this one won't do anything to help. I only paid $36 for it. or do What I have done and focus on a specific niche instead of spinning wheels on extraneous stuff. I don't own that many trains but some of the ones I do have are really nice because I focus on High speed only with some amtrak thrown in their because 'merica. 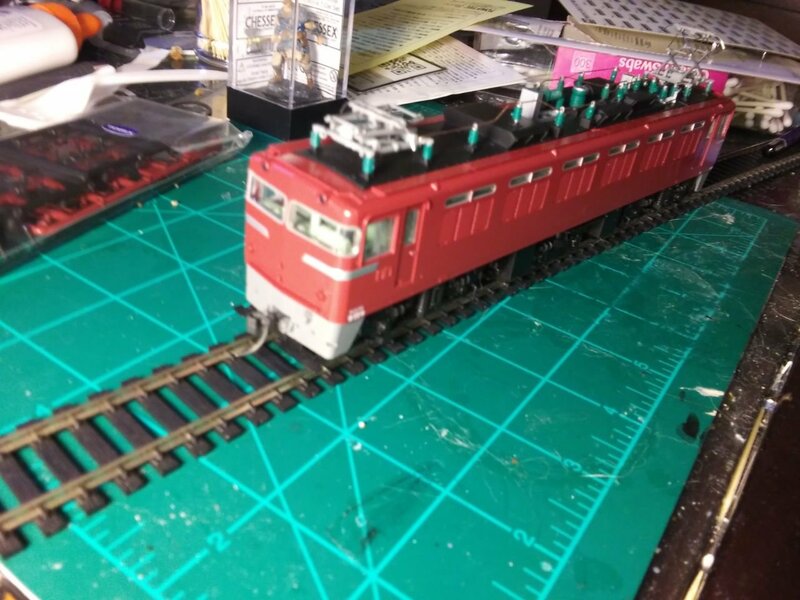 I ordered a pair of Kato HO gauge re-railers from Amazon. Complete mistake, because I only do N gauge modeling. But Amazon is tricky like that. Quite difficult to search for Kato products (they don't even ask if you meant "keto"; they just change the search terms!) and very quick and easy to make an order. But in order to get a refund I need to jump through all kinds of hoops including navigating Amazon's maze of "help" page links, and of course I'd be losing the cost of postage. At this point any refund would leave a bitter taste in the mouth. So if anyone in the US wants an S123RE, a.k.a. "Kato 2-142 HO Unitrack 123mm 4 7/8in Road Crossing and Rerailer 2pcs" it's yours for the cost of postage. 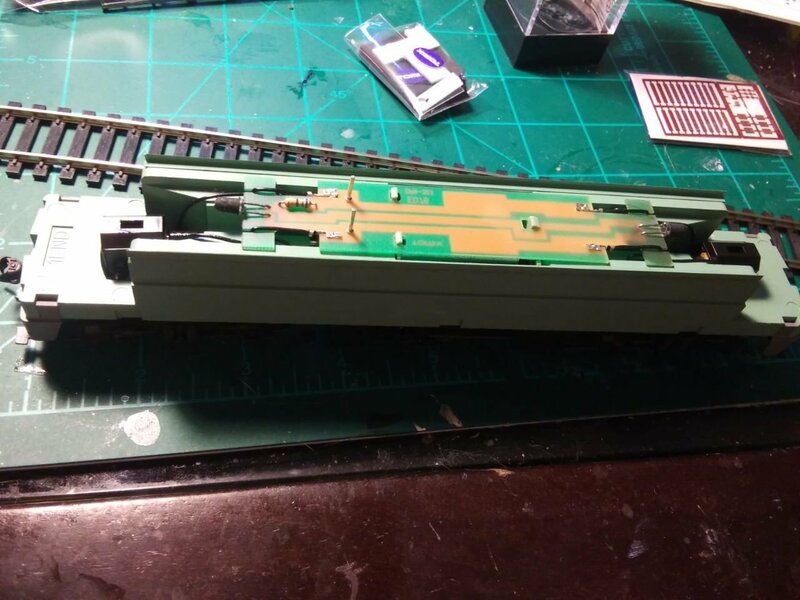 Were you looking for the N scale rerailer track/crossing? I should have a spare or two if you'd like to swap. Got my Z shorty Narita Express today - so far my favourite of the series: Nice detaill, a good finish, and the shape of the prototype translates well into shorty! I need to get trailer cars so I can run my two Z Shorties. Glad to see I'm not the only one having their Kato searches "corrected" to what seems to be the latest diet fad! Interestingly the Android app will let me override it but the Apple one won't. Ordered an Arii OHaNeFu kit to see how they go together. Will order more if it looks decent enough, this is a toe in the water without spending much on them. Very nice detail with a ton of detailing parts to add. The wipers and end mark hooks look an absolute ball ache to apply but I’m keen to add everything and being metal etched they should hold up alright. There is quite an array of jumper cables to attach on End 2 of the loco. The bogies have some exquisite detail although there’s some kind of shaft which extends from the forward bogies to a housing on the snowplough. I have tested it running on my Kato R790 curves without issue but not sure how well it would navigate tighter bends without things snapping off or derailing. Kadee couplers are applied and there are also some TN couplers in the box for attaching to the Tomix Kiha 181. I have tested these on my Kato Kiha 58s and they do couple with each other securely. As I’ve preordered the Kato Kiha 82 and 81 it’s good to know that I’ll be able to couple them together. Theres a couple of switched under the roof to turn off lights if you’ve got 2 consisted along with a switch for high and low speed. 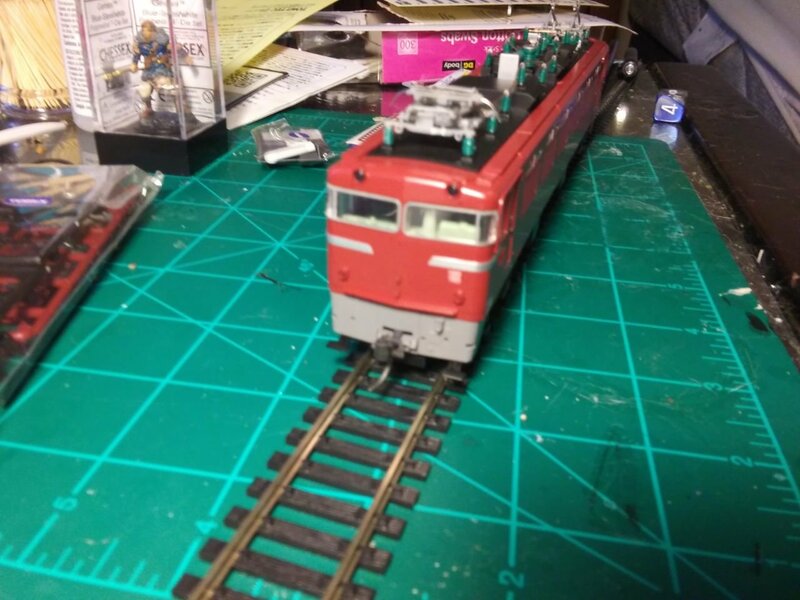 - The plastic pantographs are not as nice as the Kato metal ones. They are spring loaded but one was slightly bent in the box. I have managed to rectify it but this might occur again and seems a bit of cheap option on a nice model. - Kadee couplers are included but they are the oversized #5 type. I will switch these out for scale head #58s. I appreciate that the #5 are more universal so only a minor niggle. - Motor is a little grindy, on the corners especially, so I hope this dies down a bit with some running in. It’s certainly not offensively loud but again as it cost double what my Kato EF510 cost, I’d expect a smooth running quiet loco just like the Kato. Overall it’s a nice model and will look impressive once the vast array of details have been applied. Paintwork has a deep red with a satin sheen and has better depth than I’ve seen on my Kato locos. Hopefully the slight vibration or grinding will settle down and I may purchase some spare pantographs just in case these take more punishment despite in being boxed well. Long term I’d like to add DCC to my HO fleet and this looks like it’ll need a lot of effort to convert. Certainly not one to start with. Any DCC conversion will be a way off yet. Electronics are really not something I’m hugely competent in so I’ll need to read up and practice my soldering again. Once I I do make the leap, I’ll begin with the 8 pin Kato models to take some of the challenges out before I tackle any Tomix locos. I’d like to add sound, cab lighting, tail lights and shunting lights but I’m a way off being DCC ready. Got an HO scale crossing track as part of a trade with Sheffie. Hopefully it will make getting my HO scale models on track much easier now. 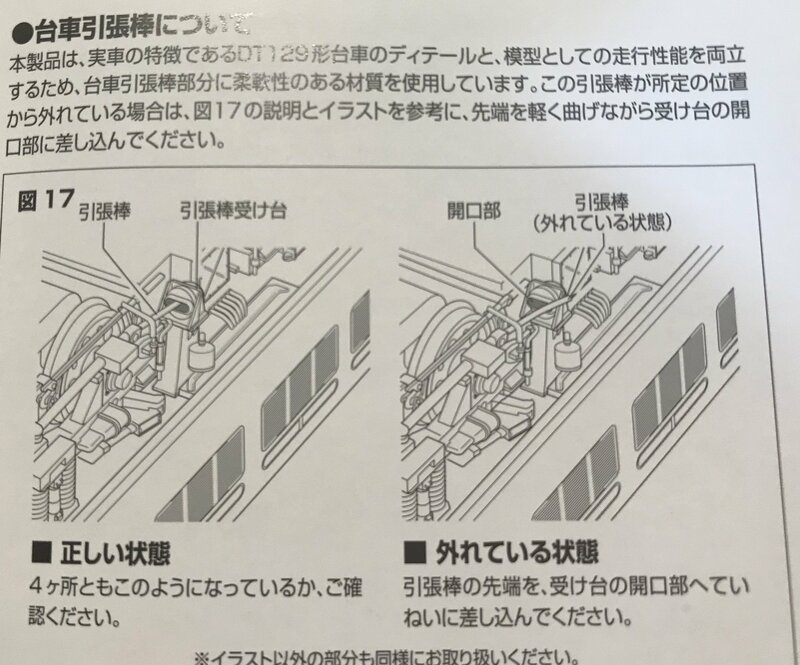 As mentioned before, I'm not too happy about Rokuhans printed stickers approach towards some shorties, in particular if my beloved series 103 is affected. 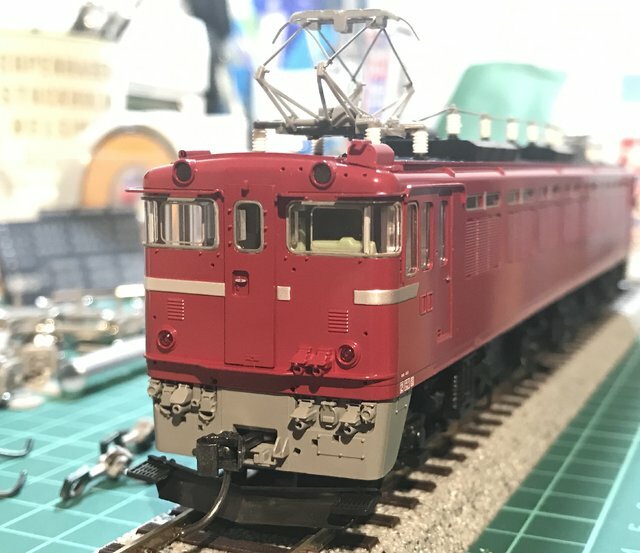 However, I came across a small Japanese company Aozoradensya, recently, who produce a lasercut kit for a commuter train, which can't be called anything but 103 (ok, 101 maybe, too...). After a quick email correspondence, which confirmed that they also deliver to foreign countries, I've ordered one set (taht was january 29th), and today (february 9th) the letter with the kit has arrived. Everything neatly packed, and luckily German customs didn't bother to have a closer look at all. Just completed detailing the Tomix EF71. Still need to add the makers plates to the side as I needed to order a diamond file to clean up the photo-etched parts. Added extra painted detail thanks to some inspiration from the KuMata OJ website. 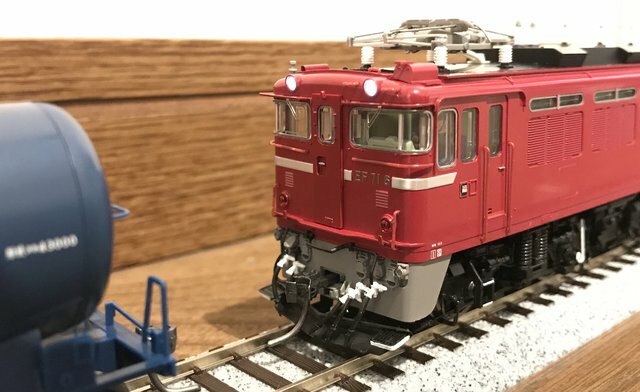 How do the Tomix locos run? I'm not a fan of more than 200 for a DC model, but that is nice. And do they have an EF81? These look excellent! Curious how much it set you back? Looks like a well thought out kit. Yes, Tomix have made numerous versions of the EF81s in 1/80th scale. There was a recent Tomix release of an EF81-600 in rose red mid to late last year. The stainless steel EF81-300 is a particularly attractive model. 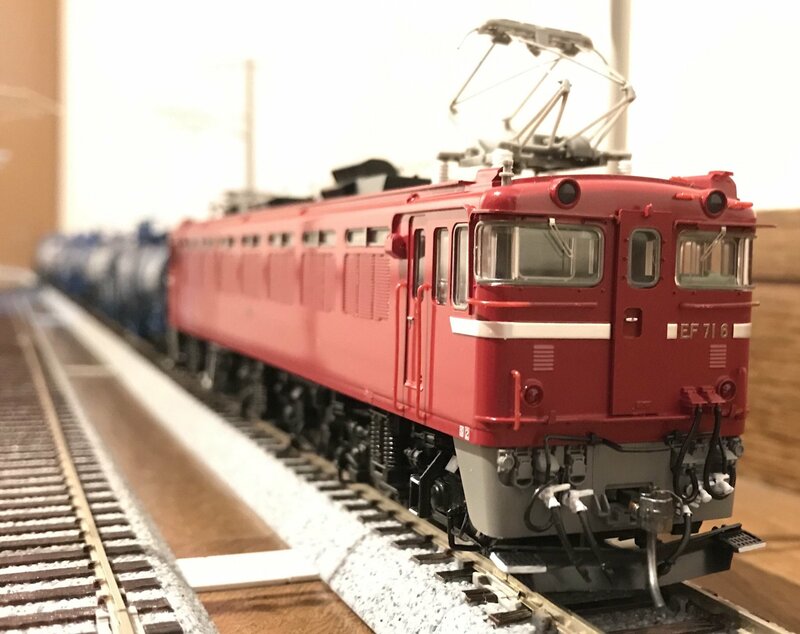 Kato also announced a planned HO EF81 in their 2019 catalogue but no more details have emerged as yet. 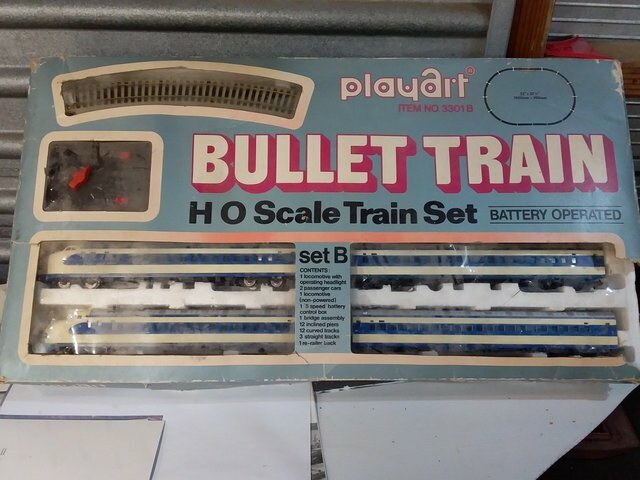 Received my HO Playart Bullet train set. Cleaned all the fluff out from the wheel axles and lubed gears and shafts. Runs better than my Lima model.Lol! The set was on a local auction site and noone was interested. scored it for NZ$10 and postage was nearly the same as purchase price. Lid a bit munted. would be interesting to find out when the set was produced. Ding ding ding, you win the deal of the day beakaboy! Nice! What a steal! Nice find. I picked this up at the beginning of January, and its been sitting an a warehouse waiting to ship out with other items, but I finally got around to having it ship and received it yesterday. the pictures do not do it justice, as it if a fine model! Also, opening it up I thought it would be more complex, but it looks like it will be a simple DCC hard wire install, I could be wrong though. I'm not sure what the poles sticking up are for though.... but the instructions that came with it show alligator clips attaching to them for some reason... need to bust out the translator! Once I tested it however, I came to realize that it is a powerful model, as it tried to jump off the rollers i have! 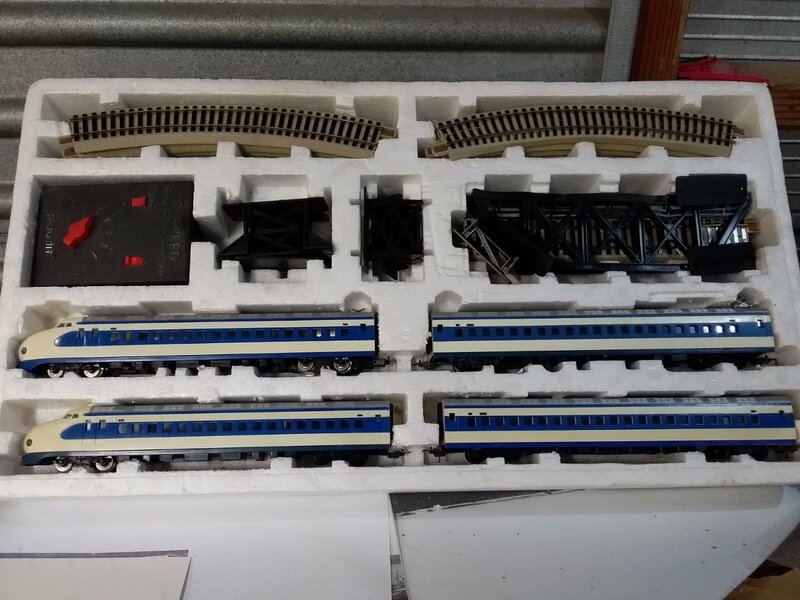 The documentation for my EF71 says these are for powering the loco so you can clean the wheels.